Width (Range: 8.00 - 48.00) In. 0 1/16 1/8 3/16 1/4 5/16 3/8 7/16 1/2 9/16 5/8 11/16 3/4 13/16 7/8 15/16 In. Height (Range: 8.00 - 48.00) In. 0 1/16 1/8 3/16 1/4 5/16 3/8 7/16 1/2 9/16 5/8 11/16 3/4 13/16 7/8 15/16 In. YES -- Your new door's outside dimensions should be 1.5" wider & 1.5" higher than your cutout. NO -- Your ideal cutout size will be 1.5" less than the width & 1.5" less than the height of your new door. Your door's orientation determines the placement of vent slots and the positioning of "dogs" on lift-out door panels. 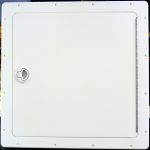 Lift-Out Door Panel With "Dogs"
Custom Door Dimensions -- From 8" x 8" up to 48" x 48" -- No extra charge. Your Choice Of 5 Colors -- No extra charge. Optional pre-drilled frame for perfectly spaced fasteners -- No extra charge. White Or Black Southco Slam Latch Included In Base Price -- No extra charge. Optional lift-out door panel -- No Extra Charge. 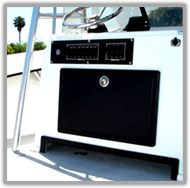 Optional yacht-quality stainless steel latches -- locking & non-locking. 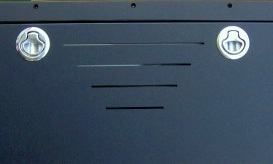 Optional vent slots for added circulation in hanging lockers etc. Optional gasketed door panel to minimimize water intrusion. 3/4" Frames With 1/2" Inset Door Panels Add Strength & Durability. 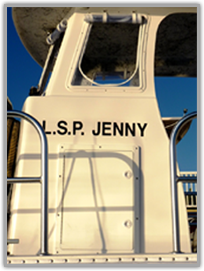 Our premium boat door frames are routed out to accept a 1/2" thick door panel that sits flush on all four sides -- and all surface edges are given a precise, smooth radius. The result is a strong, clean look and nice tight tolerances between the frame and door panel. 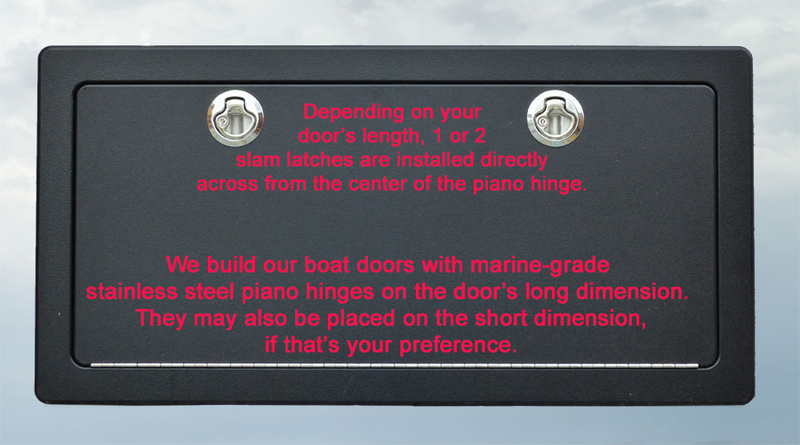 In almost all cases, we attach the boat door inset panel to the frame with stainless steel piano hinges. But we can also build your boat door with "dogs" instead of hinges so you can lift the door panel completely out of the frame — very handy where space is limited -- at no extra charge to you. Symmetrical Design Offers Installation Flexibility. Because our door latches are centered directly opposite the piano hinge, having your door open from left-to-right or right-to-left for vertical installations is simply a matter of flipping the door over so that the latch is positioned where you want it. And the same is true for doors installed horizontally -- simply position it with the latch on the top for a top-down opening door, or at the bottom for a lift-up opening door. White Southco Latch -- No Extra Cost -- This white Southco non-locking polylcarbonate latch is a standard option on our enclosures. It's handsome, tough, and designed for the marine environment. Black Southco Latch -- No Extra Cost -- Or choose this black Southco non-locking polycarbonate latch, again as a standard option. Just as with the white version shown above, this latch will stand up to the harsh conditions of a marine environment. Non-Locking SS Latch -- Add $28.00 -- And upgrade to this non-locking GemLux electro-polished stainless steel slam latch. Stylish and durable. Locking SS Latch -- Add $38.00 -- And add security to your enclosure with this locking GemLux electro-polished stainless steel slam latch. Pre-drilled Frame -- No Extra Cost-- Consider this option if you need to fasten your enclosure frame from the front, rather than screwing into it from behind. We'll pre-drill and countersink your holes at precisely spaced intervals on our CNC machine -- so there's no guesswork or uneven results. Vent Slots -- Add $21.95 -- These vents give enclosed spaces (think anchor lockers and hanging lockers) a bit of circulation. We customize the slots to look good on your door. 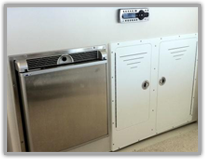 Lift-Out Door Panel -- No Extra Cost --Select this option if you need a lift-out door panel, rather than a hinged panel that’s permanently installed. We simply eliminate the SS hinge and add a pair of “dogs” that hold your panel snugly in place when your door is closed. Gasketed Door Panel -- Add $24.95 --Adding a gasket to your door panel will not make it completely water-proof, but it will minimize the intrusion of water from rain or incidental splashing when washing down your boat etc. Alternately, if you need a multi-panel door or a door with any dimension larger than 48", simply click on this link to Request A Price Quote For Over-Sized, Multi-Panel Or Non-Rectangular Doors. I'm replacing an old boat door, so I already have a cutout. I realize my new door will be bigger than the cutout — but how much bigger? Your new boat door's outside dimensions will equal your cutout size plus the door frame's width. 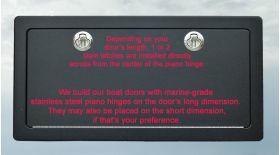 So as an example, if your cutout measures 15"W x 20"L and you decide on a 2"-wide frame, the completed door will measure 17"W x 22"L overall -- and those are the dimensions you need to enter in the boat door calculator. 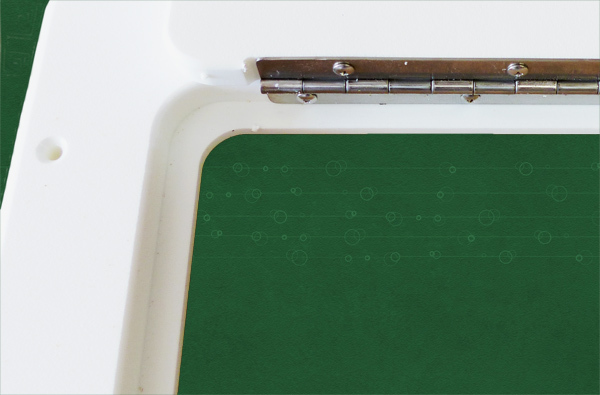 If you go with a 1.5" frame, you'll end up with outside dimensions that are a bit less: 16.5"W x 21.5"L.
Following these guidelines will give you a door that overlaps your cutout by 1" on all four sides for a 2" frame, and by 3/4" on all four sides for a 1.5" frame. Will my new boat door's access opening be the same size as my cutout? No, it'll be smaller. If you choose a 2"wide frame for your new door, your access opening will be 2" narrower and 2" shorter than your cutout. For example, if your cutout measures 15"W x 20"L, your door's access opening will measure 13"W x 18"L. If instead you go with a 1.5" wide frame, the access opening will be 13.5"W x 18.5"L.
Making the access opening smaller than the cutout gives your installed door a neater appearance — and pretty much eliminates any contact with the typical cutout's rough-sawn fiberglass or plywood edges. I need for my new boat door to have an access opening of a particular size. So how do I figure out how big the cutout needs to be — and what the door's outside dimensions must be — to make that happen? Okay, another example: If you need an access opening that measures 10"W x 10"L, add your frame size to those dimensions to get your cutout size. If your new door gets a 2"-wide frame, your cutout size will need to be 12" x 12". To get the total outside dimensions of your new door, add twice the frame width to the access opening you need — so a 10" x 10" access opening for a door that has a 2"-wide frame will end up with outside dimensions of 14" x 14". How far will my new King Starboard boat door stick out from the surface I mount it on? 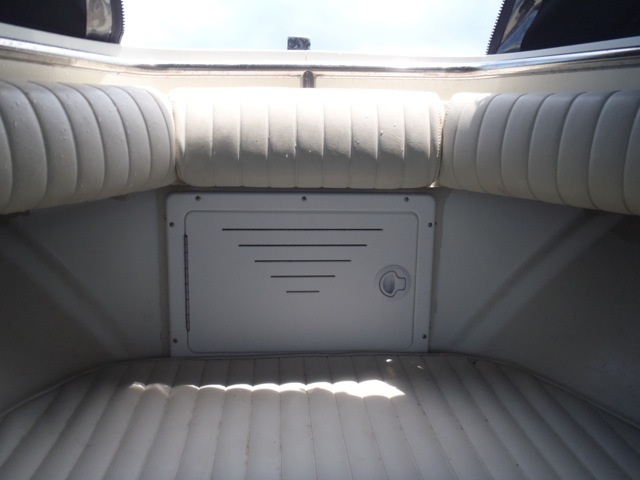 It'll protrude 3/4" inch from the surrounding console or bulkhead area, which is the thickness of the door's frame. The door panel itself is inset into the frame, so the frame and door panel are flush with each other. For added strength and stability door panel rests against an inner lip of the frame that's 1/4" thick and 3/8" wide. Will my new boat door be waterproof? No. However — because the door panel is inset into its frame against an inner lip that's milled out to a fairly close tolerance — your door offers some resistance to the kind of incidental splashing that might result when you're washing down your boat after a day's fishing or whatnot. If I order vent slots, will they be angled down so water can't splash straight through them? No. We cut the vent slots straight through the door. The most important reason for this is safety. An angled vent slot in a Starboard door would present a sharp, knife-like edge that could easily draw blood — and we don't have a way to put a uniform, smooth radius onto that edge. While it's true that water can get through these openings, our slotted doors are typically either installed in something like a hanging locker down inside the boat — and (we hope) there's not much risk of taking in water there. Or they're used as access doors for anchor lockers, which themselves are usually wet anyhow (and also have built-in drains). 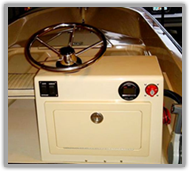 Where do you position the vent slots on boat doors? We'll place them toward the upper part of whatever door you order. If you're going to install your door so that the long dimension is vertical, we need that information — and we need to know whether your door will open from right-to-left or left-to-right. If your long dimension will be installed horizontally, we need that information as well. I might want to change my boat door's color sometime in the future. What kind of paint works best on Starboard? Sorry, none at all. No sort of paint we know of will adhere to King Starboard. But so long as you choose a Starboard color you like to begin with, you can count on it holding up without fading pretty much for the life of your boat. Can I just glue my new boat door into place with epoxy or something, instead of attaching it with screws and such? Nope. In much the same way that paint won't stick to King Starboard, over the long haul neither does anything else that we've tried — including 3M-5200, silicone, nor various flavors of "boat caulk." The King Starboard company does sell a product called "StarBond" — but it's expensive, requires an expensive "applicator" and in the end, the product's instructions caution that the "join" should be supplemented with mechanical fasteners. So really, we recommend you save your self some money and aggravation and disappointment, and, uh, stick with screws or other fasteners of your choice. 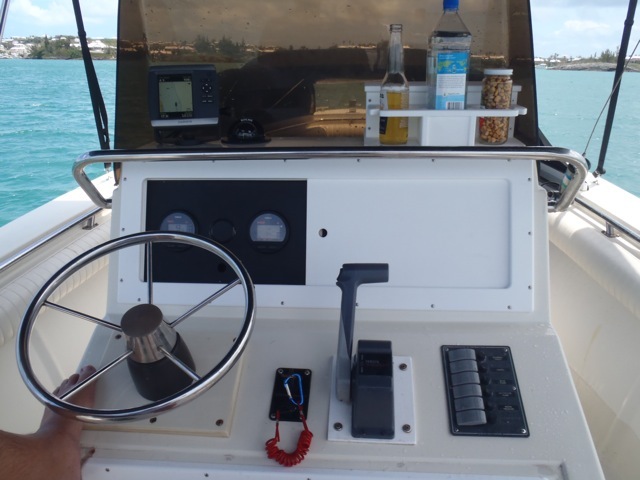 "I received an expertly packaged door and...was amazed at what I saw: A door custom-made for the console of my Boston Whaler in the exact color and shape as promised! The workmanship on the door is absolutely superb." "You guys do good work. Thanks again." PumpOut USA, a major manufacturer of waste collection vessels, is a steady Buck Woodcraft customer. Shown here is a 2-latch console door that outfits their 26' portable pumpout station. "We got rid of an ice maker that was just wasting space and opened up some much-needed storage. The turnaround time was great and the quality is outstanding." Anchor locker door "before": No air circulation, no positive locking latch, badly weathered teak frame. 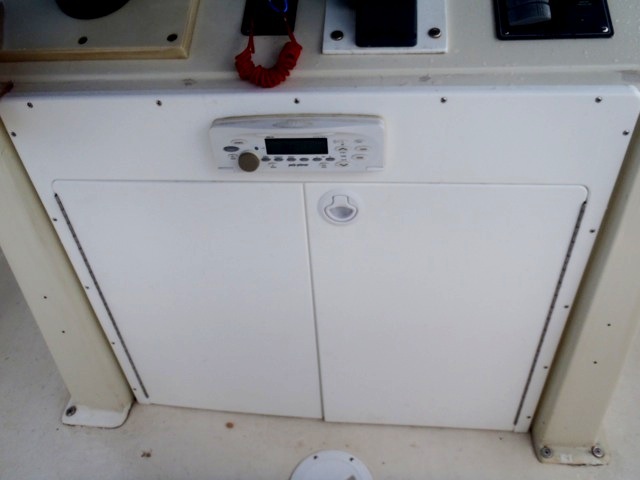 Anchor locker "after": Vent slots for air circulation, positive slam latch closure, stainless steel piano hinge, all King Starboard frame & door panel. Instrument panel closure "before": acrylic panels, teak frame in poor shape. Instrument panel "after": All King Starboard construction, including sliding panels. Console double door "before": poorly aligned acrylic panels, no positive closure latch, separate radio mounting panel, badly weathered teak frame. Console double door "after": Integral radio mount panel, all King Starboard frame & panels, stainless steel piano hinges, positive panel closure with single slam latch. John helped me out with a great quality door. Fit perfectly and was very well made. Couldn't be happier with the product or customer service. I had an original glove box door that never worked correctly. My new door is an excellent quality door and exceeded my expectations.!!!! Prompt, friendly service. Product is quality made and fit perfectly. Highly recommend. Thank you for your great service and a simply wonderful product. I received my beautiful boat door and could not be happier – packaging was second to none. The door is a real craftsman’s joy and it looks amazing fitted on my boat. I will be ordering another identical door very shortly plus some additional smaller doors. Hatch arrived. Love the quality -- could I please order a second hatch identical to this one? Excellent quality and fast service. The product exceeded my expectations.